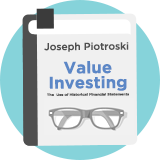 The Piotroski F-Score Screen is a quality strategy outlined by the famed academic Professor Joseph Piotroski and investigated further in a 2011 paper titled "Identifying expectation errors in Value/Glamour stocks". The strategy hunts for the best quality shares in the market regardless of price. In this version of the screen we have selected the highest scoring stocks in the market using Piotroski's nine-point fundamental checklist called the F-Score. While the F-Score was originally used only for filtering value stocks, Piotroski discovered it was just as effective for filtering glamour stocks: "Firms experiencing the strongest improvement in fundamentals (FSCORE ?7) generate a mean size-adjusted return of 5.5 percent annually". What Piotroski essentially was saying was that the highest scoring stocks returned 5.5% more than the market - these findings have been backed up by independent research by Societe Generale. Perhaps as a result the F-Score has become extremely popular with investors and is a core component of the Stockopedia StockReports. Associate professor of accounting at the Stanford University Graduate School of Business. Developed the F-Score. Josef Piotroski published this paper as a professor of the University of Chicago Graduate School of Business. Follow the link to download the original paper and learn more about the strategy.